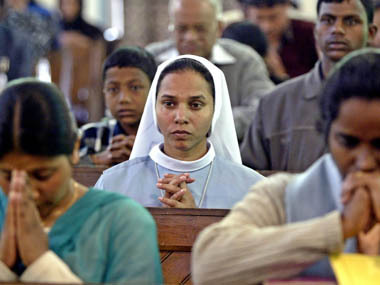 Browse > Home / India, newsletter-india / What does it take to be a Bengali Christian? What does it take to be a Bengali Christian? Bengal, July 31, 2017: As personal crises go, a name such as mine can occasionally lead to an existential one brought on by Sukumar Ray’s poem, Tyash Goru. The rhymes in his whimsical collection, Abol Tabol, have been variously and studiously interpreted as being layered with hidden references, double entendre, and even signalling via a deft use of language resistance to colonialism with the apparent nonsense making it appealing to all ages. Like millions of Bengali children before me and after, I have had the distinct pleasure of reading and memorising many of those verses. As one with a Western first name, a Bengali surname, with in-between Sanskrit names, I have often been plagued by the thought that Ray was alluding to us Bengali Christians in his poem which when inadequately translated reads, ‘Limey Cow’ and sometimes politely, ‘Strange Cow’, even ‘Sophisticated Cow’. Yet, as most Calcutta people know, street slang terms Anglo-Indians as ‘tyash’. Not that I find it offensive in any way since I count Anglo-Indians among some of my dearest friends and owe many of my life experiences to that diminishing community. Which then leads me to try and understand what the creature called a Bengali Christian might be. In common parlance, a Bengali must be Hindu. Anyone else, regardless of the fact that their mother tongue is Bangla and they claim their origins in this beautiful verdant land, is either Muslim, Anglo, Buddhist and so on. Bengali Christians number about a lakh and twenty five thousand in the urban agglomeration of Kolkata according to the 2011 Census, quite a bit more than Anglo-Indians, and a tad more than Jains, Sikhs, Buddhists and others. I personally know some Jains and Sikhs born and brought up here, who speak, read and write Bangla as well as any Bengali, have never ever thought of returning to their places of origin, but for reasons that perhaps make no sense, are not considered Bengali. The Bengali Christian then somehow doesn’t quite fit the bill. We can speak English as a first language but are equally comfortable in Bangla, worship a single god originating in the Middle East within the confines of usually majestic colonial architecture, seem to get very envied preferential admission to those much-aspired-for English-medium educational institutions, and eat food that straddles many cultures. I love the astonished look on Bengali friends’ faces when I tell them that the sacred Bengali Sunday lunch of mangsho-bhaat could often well be rice, dal, accompanied by fried masala pork sausages handmade in the Entally or Park Circus markets with boiled potatoes. The astonishment usually leads to stupefaction when told that we also eat shukto and jhingey-posto. Or halka maacher jhol. And then we have surnames that span the Brahminical to the Dalit, but usually marry persons without regard to caste, creed or community. Damn! Who on earth are we? Doubting Thomas, better known and revered as St Thomas, one of the twelve apostles of Jesus Christ, brought Christianity to India in 52 CE, though the less politically correct label AD is possibly more suitable in this context. Christianity expanded in the south western regions of India but took almost 16 centuries to get to the East when the Portuguese came to trade under the munificence of Akbar the Mughal emperor. The British missionaries came a century or two later and set about not just converting the bloody heathens, but ended up compiling a dictionary of the Bengali language, printing the Bible in Bengali thereby initiating the wider availability of the Bengali written word, founding educational and medical institutions, effecting sweeping changes, disrupting tradition and society, and proceeding to otherwise make a nuisance of themselves. The Bengali Christians are obviously converts, either recent or since many generations. The permutations of these conversions followed two paths — those who converted to escape persecution and discrimination and its resultant poverty, and those who chose it for philosophical and/or intellectual but not fiscal reasons. In either case, the overbearing reason was essentially to gain advantages in an unequal world. Unfortunately, there really is no specific history or sociological study of the Bengali Christian other than very general knowledge and assumptions. This, in a way is a good thing because they never have considered themselves to be a separate community. After all, faith is a personal thing. Why should it distinguish identity? So when I hear someone addressing me as Pratik or Kartick in spite of reading the correct spelling with a frown on their face but looking at me with a relieved smile as they get to Ghose, I don’t take umbrage and these days I don’t even bother correcting their error, being confident in knowing who I am.